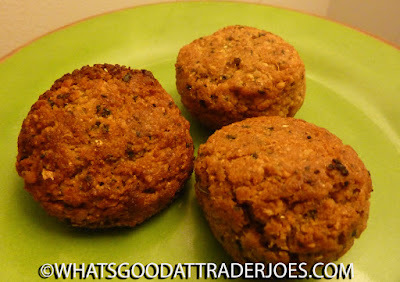 It's been seven freaking years since our review of Trader Joe's Heat & Eat Falafel. Seven years. Goodness. I'll spare you the spiel about how and when I discovered falafel since I covered that in the previous review. 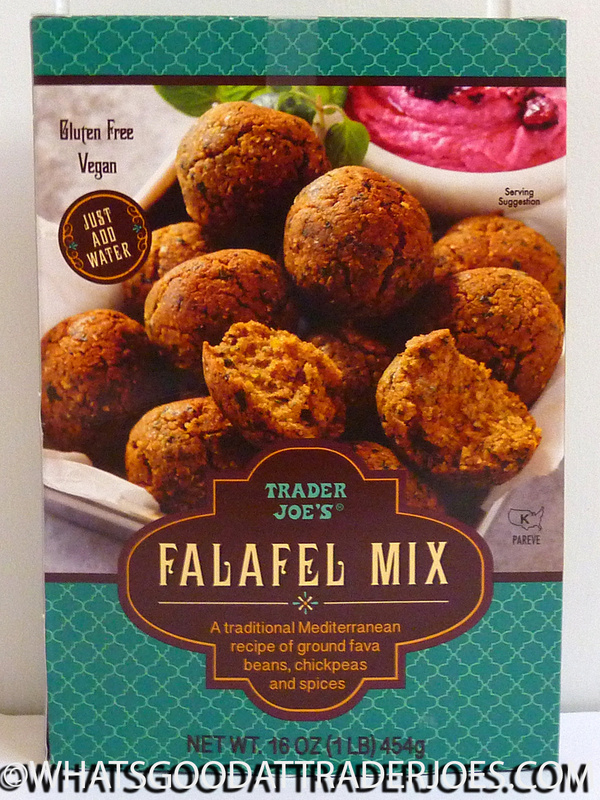 Suffice it to say that I like it, and both Sonia and I thoroughly enjoyed Trader Joe's frozen falafel offering. So how does this mix n' fix variety square up? Read on. Shelf-stable and affordable at just $2.99 for the whole package, this mix can mix it up with the best of them in my humble opinion. The spice level was just about right, and at least when fried, the texture isn't quite perfect, but close enough to justify featuring this product as the centerpiece of a Middle Eastern or Mediterranean meal, as well as repeat purchases in the near future. 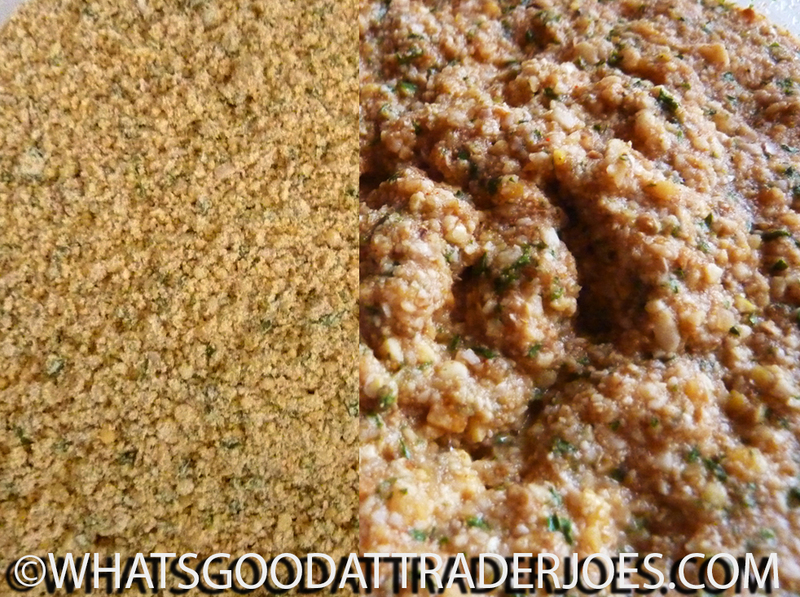 Check out the pic of the mix just by itself (left). When something looks this much like sawdust, my expectations automatically go down. Not necessarily because it will, in fact, taste like sawdust, but because my overactive, neurotic brain will insist that it is sawdust. 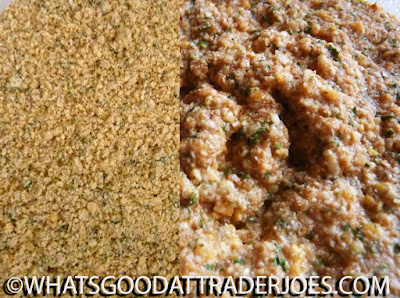 Fortunately, the next step—the "just add water" step (right)—looks slightly less like sawdust and more like a gritty, hummussy paste, and the final step after frying looks shockingly like normal falafel. I feel like the product is just a little more inclined to fall apart while being eaten than other types of falafel, but if it's being served in a pita, that's really not an issue. We had it with pita bread, this excellent Trader Joe's brand tzatziki sauce, and some hummus. It's satisfying and filling, and it's got a nice nutty flavor. Of course, when fried, the extra olive oil helps out with the taste. We did try making a batch in the oven, too. It's nothing to complain about, and it's a little less calorific that way, although you do have to coat them with oil before baking them. I'm sure they pick up significantly more oil when fried. Frying them also improves the structural integrity of the product somewhat. From the oven, it's just a tad too dry for my taste. Both preparation methods involved a one hour period for the mixture to set. Sonia thinks the frying would have been a lot simpler with a deep fat fryer, while she simply made them in the skillet. Sonia insists these turned out better than the aforementioned heat and eat style falafel. I think I liked the heat and eat ones just a mite bit more than these, but we both agree that this product is a better value overall, making three large batches of about nine falafel balls each. The box claims there are nine servings of three balls each. Our serving sizes tended to be larger than just three falafel balls—we ate four or five in a single sitting, but there are easily, at minimum, four to six meals-worth of falafel in the package, even for larger appetites. Five stars from Sonia. Four stars from me. Doesn't look like there is any obvious gluten in there either, so yay! Sounds like the Zhoug sauce would be great on top of these! I don’t like TJs pitas but I LOVE the plain frozen naan so i use that for any pita style sandwiches. I bet with some israeli salad, chopped tomatoes, tahini sauce and hummus these would be great. There are plenty of options for excellent falafel here in nyc but it would certainly be more budget friendly if i could make at home too! I did half a recipe and baked it in the bottom of my rice cooker on the cake menu with a little olive oil. Brown on the outside, moist on the inside. Came out like one big felafel cookie perfect for dipping or slathering. We made it into falafel waffles with the waffle maker. Pretty darned good. Hey, monitor your kids after eating this stuff. It took a box of these to realize my son has G6PD (Glucose‐6‐phosphate dehydrogenase (G6PD) deficiency is a common genetic disorder, affecting nearly 400 million individuals worldwide). That's not a small number of people. That's about 5% of the world. Anyways, my 4 year old son starting becoming lethargic, eyes turned yellow, pee turned orange, starting hallucinating and other symptoms. I took him to the emergency room. He had jaundice and needed a blood transfusion. After numerous tests and long story short, we found out that he had this G6PD which does not let his body consume FAVA Beans. The number one ingredient in this falafel. You don't find this in most mixes, nor did we know what this was. However, watch your children and keep this food in mind if something happens. Let the docs know. It's prevalent in Africans and Middle Eastern males. The cumin spice is too overpowering! Not a repeat buyer.